The company has been developed by investment and acquisition from a traditional machine shop base and consequently we are able to provide an extensive range of conventional machine shop services to support a wide range of industries. Our combined operations allows us to undertake the manufacture, repair and refurbishment of castings, fabrications, shafts etc. 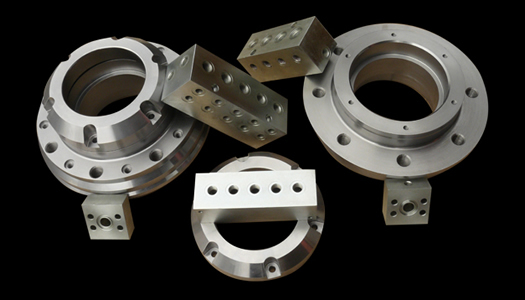 used in a variety of applications. The company operates a range of medium to large traditional centre lathes supplied by a range of manufacturers with a capacity up to 5 metres between centres, turning 500mm over the saddle, we are also able to turn smaller jobs to 1000mm over the bed. 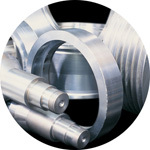 This allows us to provide a comprehensive service for the manufacture of large shafts, wheels, rollers, pulleys, bearing housings etc. to a wide range of industries. Typical range of turned parts. Tool with two 600mm long keyways. A fully machined Housing with internal Keyway for the paper making industry. Turning a Shaft in a 5 metre lathe. We have a range traditional borers, millers and bed mills up to a table size of 5000 x 1000mm allowing us to provide our customers with a wide range of conventional milling operations. Cutting keyways in a 3 metre long, 500mm diameter tapered shaft. A large (6 tonne) EN24T block fully machined on a 5 metre bed mill. Machining a pair of jaws on a horizontal borer.